/Personalizing Your Items /T-Shirts /Can I add a picture to my T-shirt? This is totally possible. 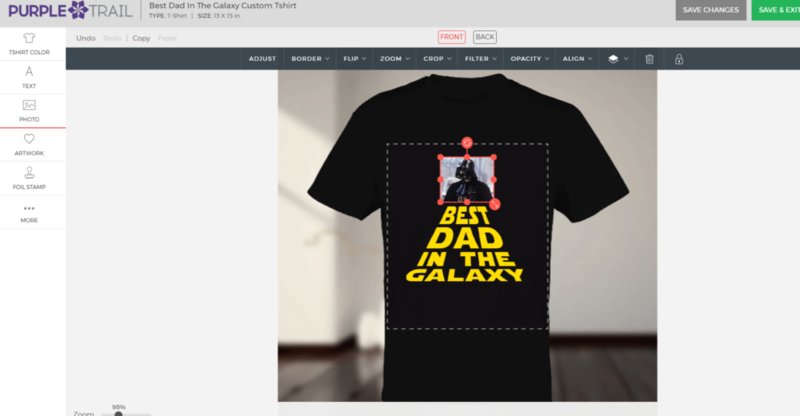 If your image is in a png, gif, or jpg format, you can upload them directly to the tshirt designer and place them on the shirt. This walkthrough is specific to the desktop version of our website. The application for Iphone/Ipad will have a different look. Your first step always in designing the t-shirt is to find a base design or template that you like or can work with. On that page, there’s a Personalize button. Pressing that will direct you to our Design Center, like any card, planner, or invitation. You’ll have a few options here, but we’ll focus on uploading the photo. The images below should help. The “Photo” tab will bring up a library of photos you have used in previous designs if you’re a return customer. If this is your first time using our Design Center, this library will be empty. Above this library, there will be a “Upload Your Own Images” button. If you click on this, you can select a photo you have saved onto your computer to load into the Design Center. Upon clicking Upload, you’ll be able to either drag and drop an image from a folder already open on your device, or you can click to open a file browser window to search for an image on your device. 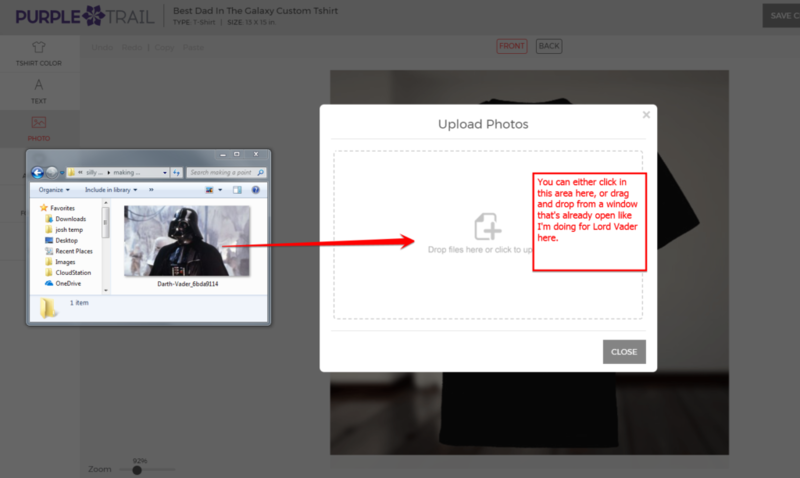 The images you select will show a thumbnail and a loading bar to show their upload progress. This should go rapidly unless the photos are very large. However, the bigger they are, the better they print! Once the loading bar is complete (it will say “Photos Uploaded Successfully!”), you’ll close the Upload Photos box to return to the main design screen. From there, hover your mouse over the photo and you’ll see a Plus sign appear over the photo. If you click on this, it will add your photo onto the t-shirt, where you can resize and place it wherever you want on the shirt. You can design a great many things with use of your photos and those on the web, plus our embellishments and other assets found under the Artwork tab! Enjoy!